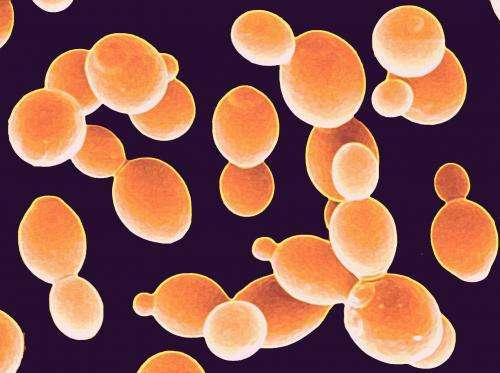 Using the baker's yeast Saccharomyces cerevisiae, Patricia Wittkopp and her colleagues developed a novel way to disentangle the effects of random genetic mutations and natural selection on the evolution of gene expression. Their findings are scheduled for online publication in the journal Nature on March 16. The first authors of the Nature paper are EEB graduate student Brian Metzger and former MCDB graduate student David Yuan. In their study, the U-M researchers used the TDH3 gene, which helps baker's yeast cells convert sugar into energy used for growth. To understand how different genetic mutations impact TDH3 expression, they systematically changed each of the DNA base pairs in a region of the gene known as the promoter, which controls the amount of the gene that is expressed. They created all of the different possible genetic mutations in this region and measured the change in gene expression caused by each mutation. "Surprisingly, we found that most mutations didn't change the average expression of TDH3 but instead changed how variable TDH3 expression was among genetically identical cells," Wittkopp said. "It would be as if you changed the recipe for a loaf of bread in a way that didn't change the average quality of the bread but instead caused individual loaves to be unpredictably good or bad," Metzger said. The researchers then surveyed natural yeast strains to see which of the many genetic "recipes" the yeast actually use in the wild. "We found that versions of the sequence controlling TDH3 expression that increased variance in gene expression were rarely found in the wild, indicating that natural selection prefers TDH3 expression to be consistent, resulting in similar amounts of gene product in every cell," Metzger said. The experiments showed that natural selection can act not only on the level of gene expression but also on the consistency of expression. This consistency of gene expression, known as expression noise, affects evolutionary fitness by altering the chance that a given cell has the most advantageous amount of a gene product. "Measuring the effects of new mutations provides a critical, but typically missing, piece of the evolutionary puzzle," Wittkopp said. "This study shows how knowledge of what can happen to traits in the absence of selection provides novel insight into the evolutionary processes that give rise to genetic differences observed in the wild."